Guess what? Today is a highly anticipated day (believe it or not – it isn’t just April Fool’s Day). Today Disney’s The Pirate Fairy can be purchased on DVD and Blu-ray. Hip hip hooray! Over the weekend my girls and I went to a media preview of The Pirate Fairy. Let me first say that they were over the moon excited to see a Tinker Bell movie on “the big screen.” That has not happened in their little life times. I was just as excited as they were. Both Big Sister (age 7.5) and Little Sister (age 6) LOVED this movie. In fact, they said it was the best Tinker Bell movie they have ever seen – it was even better than The Secret of the Wings. When I asked what made this movie even better than the other movies they said it was because of the Baby Croc (who is absolutely adorable) and the pirates (of course). They also liked that the fairies talent’s were switched. I am a Tinker Bell fan. I love Mae Whitman (she is awesome on Parenthood) and this movie is also my favorite Fairies movie as well. I enjoyed the science aspect of the movie as well as all of the teamwork. 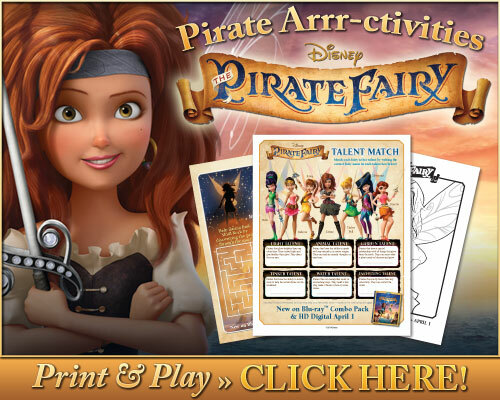 Disney knows how to pick great songs, and there are several songs in The Pirate Fairy that I would love to download to our play lists. Friendship, team work, pirates…what’s not to love? In anticipation of Tuesday’s release of Disney’s The Pirate Fairy check out a (pirate) shipload of fun Arrr-ctivities Help the Fairies by matching them to their original talents, help Zarina find Skull Rock by guiding her through a maze and then add some color to the fairies’ lives with character coloring sheets. Click the box below to get your own activity sheets. Which Disney movie is your favorite?